Emerion Review 2019: Is Emerion a Good Hosting? Vienna-based Emerion is a web hosting provider that strives to provide its clients with the latest technologies. It offers unlimited bandwidth with all plans. Emerion was founded in 2001 by CEO Alexander Windbichler. The company and its servers are based in Vienna, Austria. Services and support are offered in English, German, Italian, and Croatian. The shared hosting plans mostly differ in the level of advanced functionality you’ll have. For instance, you won’t get any web transfer logs or cron jobs with the entry-level plan, and you’ll only be able to host more than one domain from the second-tier Gold plan onwards. More importantly, you won’t get support for SSL certificates until the highest-tier Diamond plan. Even then, the certificate won’t come included in the package; it merely affords you the option of purchasing one. 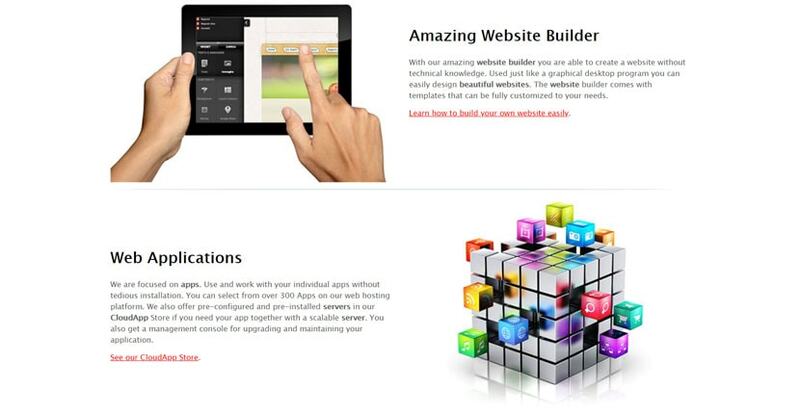 On the plus side, you do get a website builder and a one-click installer, so beginners will have some help in setting up their first websites. Note, however, that Emerion does not offer an uptime guarantee or a CDN, so performance and reliability may be an issue. At first glance, Emerion’s plans look very reasonably priced. After all, you get unlimited bandwidth, a decent amount of storage, and beginner-friendly features like an app installer and website builder. But Emerion does not offer a free domain registration with any of its plans, meaning this will be an additional cost. Also, you won’t get free SSL certificates with any of its plans — and in fact, you won’t even have the option of installing one until the highest-tier plan. SSL certificates are also pricey relative to the cost of web hosting, so the hidden costs really begin to add up here. This means that beginner webmasters who want to get a simple website up will be at a huge disadvantage with Emerion. If you have multiple websites, you may find a home here, but you can also get similar value elsewhere — with fewer hidden costs involved. Available billing periods include monthly, quarterly, half-yearly, or annual cycles. Sadly, there’s no money back guarantee, but you’re eligible for a prorated refund if you cancel within the first 30 days. The good thing is that Emerion has above-average support. 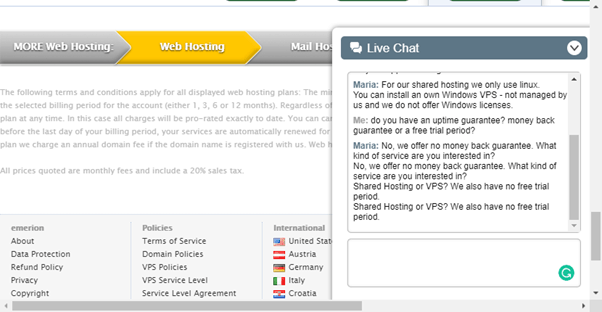 Available support channels include support tickets, live chat, and email. I connected with Emerion’s support staff over live chat. While the responses seemed a bit scripted, they were quick — and it seemed I was talking to a real person who understood the company’s policies. Emerion offers decent web hosting packages with unlimited bandwidth from its servers in Vienna, Austria. However, performance may be an issue and there are many hidden costs that you must watch out for. Wondering how Emerion stacks up against other Web Hosting companies? Enter any other Web Hosting company and we will give you a side-by-side comparison.